Some years ago Ibrox Noise discussed the problem of moving on from the Warburton era – the fact this Rangers team had been built with 4-3-3 and a ‘tiki-tika’ style passing game. It got found out in the SPL, but we posited the fear that a squad built from the ground up to play that way but with insufficient personnel to do so was going to take a hell of a lot of overhauling and time to change. Remember all that nonsense about possession, and how Rangers would dominate the ball under Warbs but fail to do anything with it? Right now we’re seeing the same aimless football by Gerrard’s men, a constant inability to get to the metaphorical point and frequent passing to death. Somehow, Warburton’s imprint on this club can still be felt today, and we continue to play an awful lot of powderpuff passing football which goes nowhere and leaves fans frustrated. The curiosity is only two of the players in Gerrard’s standard XI were brought in by the Hat, yet the whole team continues to play the same way. Obviously the team follows Stevie’s instructions, we assume, but we guess the issue is what Steven Gerrard’s Rangers team’s identity actually is. We even mentioned some weeks ago how we still couldn’t figure out if it’s a 4-2-3-1 or a 4-3-3, and if it’s not overly clear to us by touching on April, there may be an issue with clarity on the players’ parts too. Whether it’s manager instruction, players not following key commands or players simply not being good enough, Rangers’ ponderance with the ball is a massive reason why current form is so utterly wretched. Rangers have not won since the 27th of last month against Dundee – and the system has clearly been failing. The problem is we don’t know what the system is. Top clubs play possession football. Tiki taki is what Barcelona excel at. But you need the players to do it.However reverting to hoofing the ball up the park having kicked everything that moves as is the norm in Scottish football is not the answer. We might win league occasionally but will never progress in Europe which is surely our ambition. But even Barcelona have no nonsense defenders but who can play a bit. Our back four have made some stupid mistakes which has cost us big time. ( I cringe at Worrall mistakes). But no doubt these guys have sought to play out of back. If they can’t do it then get rid of them. You seem to be advocating we become like the common thugs in Scotland.No Stevie is on a mission, not just to get to the top but to do so in modern style. If he succeeds he may drag Scottish football into 21st century. It’s not easy at present given leniency shown by refs and incompetence by SFA. We seem to be investing properly in academy. Sure that’s long term but that must be where we are headed. If we fail Scottish football will fail. Celtic could and should have set standards but they failed. We must and will succeed. Agree. There is nothing wrong in trying to play proper football. And maybe Warburton would've done better if he had better defenders and a number 10 type player. That's where we stand today. We just need better players. Being direct is not the answer. Every team has to play within their means and sad to say that is what Rangers are doing. The best racehorse trainer in the world will win nothing with donkeys masquerading as Shergar. They do have Najinskys, unfortunately of ballet dancer repute, not the derby winner. Agree. Get the blinkers on and build slowly blocking out what is going on around us. 10 IAR is an irrelevance to us. We have much bigger concerns that concern the very future of our club. Gerrard is playing the way Warbs played, just with slightly better players. Both managers have been brave in trying this but the players simply fall short. When Rangers dominate the ball and do so with pace, they look good. However, all too often the tempo is too slow. If you watch one of our games and follow it immediately with almost any match from the EPL or EFL Championship, the difference in tempo is astonishing. I always want my team to win but I don’t want to watch a bunch of hammer throwers - bit of a dilemma really, but the changes have to start at junior level. We need a couple of "hammer throwers" to bring in against thug teams. It worked for Souness with Terry Hurlock. Just rewatched Goldson's tackle and Findlays assault on Grezda. Goldson was not last man, guess that was why it was yellow, but it would have been hard to argue against a red. But Findlay shouldn't have been booked at all - he should have been taken from the field by Her Majesty's constabulary to a station to be processed!!! FFS, I despair for Scottish football when people can do that and not be ordered off. In my opinion, it's a lack of courage and hunger. If that's their best, half of them, then it's just not good enough. Sideways passing and no creativity. Simples. Here we go again with some fans! - Investing in the first team is always the first answer when the players brought in don't appear good enough! Every single player in our squad is good enough to win things in Scotland and are better man for man than most in the league. I'd put my house on it if Walter Smith took this team right now as is he would make a title challenge next season and win silverware with it because there is enough in it to certainly win trophies in this league. The other thing about Gerrard is doing it right in playing stylish football so to speak is also nonsense. You have to always win in the most effective way. Would Barca still be playing Tiki Taki football if the whole league sat behind the ball? No they would find a new way that was effective against that type of opposition. What they wouldn't do is continue playing a style that doesn't work in its environment and dropping points because it looks good or they believe it's how the game is played. In sport it's about finding weakness in your opponents game and exploiting it. Why did Rangers not play Tiki Taki football whilst dominating the 90s even though we had the players to do it?because the manager was experienced enough to know it doesn't work. Did it mean we played like other teams? Of course not. It meant we played fast, direct football, we took players on, we hit the bylines and whipped balls in, we hit shots from outside the box and essentially dominated games and all whilst staying strong enough at the back to stop other teams hurting us so easily. 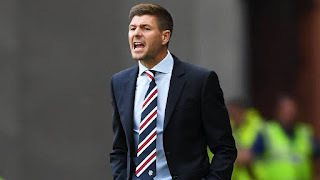 Some fans seem to be suggesting Gerrard style is the way forward..let me point out, Gerrards style has seen us fall double figures behind Celtic and seen us knocked out both cups and drop points against teams with players that are nowhere near the quality of our own..Gerrard will either adapt or fail exactly like he has done this season, and marquee signings will not change that..only changing his plan will. There is more than one way to play proper football and tiki taki is not the answer. There is nothing wrong with passing football when it is done with pace and power. We will always need to invest in our team, even when we get back to winning ways, and a couple of marquee signings that could be a driving force in midfield and a creative number 10 could transform our team. I agree Rob, we always need to stay fresh and keep adding quality but our problems are ones I don't believe a couple of Marquee signings will fix. But If we signed Eden Hazard tomorrow we'd still be poor at the back and losing goals with and dropping points. Gerrard needs to sort out the problems at the core, which he has failed to fix so far..
c) longer range shots from twenty five yards or so out. We do one of these.